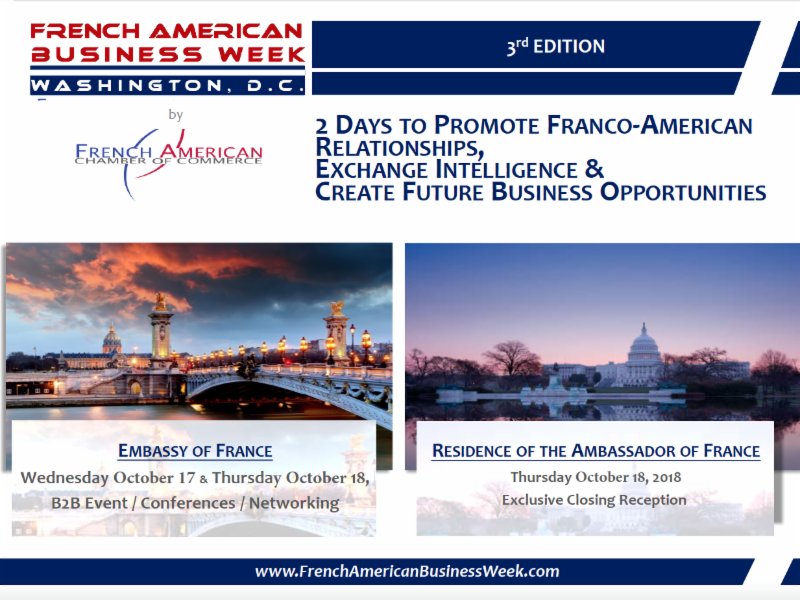 After the success of the 2016 and 2017 editions, an enhanced and even more ambitious third edition of the French-American Business Week will take place in Washington, D.C., in the elegant and exclusive setting of the Maison Française inside the French Embassy. This B2B event is organized - under the High Patronage of the Ambassador of France to the United States - by the French-American Chamber of Commerce in Washington, D.C., whose mission is to advance fruitful business relationships for its members and support bilateral trade. Combining inspirational keynote speakers, engaging networking events and a valuable showcase of top French and American companies and organizations, this first French American Business Week in Washington, D.C. is a unique opportunity for exhibitors and sponsors to increase their visibility and grow their business while benefiting from the exceptional "Maison Française" located within the French Embassy. Wharton Club Members: Click here to get your complimentary ticket(s)!!! The event will end with a magnificent and exclusive Champagne reception at the French Ambassador's Residence in Washington, DC. - There is a fee for the reception. DON’T MISS A DYNAMIC AND USEFUL SPEED NETWORKING SESSION. BRING YOUR BUSINESS CARDS AND YOUR MOST POSITIVE ATTITUDE!